True Skool Hip Hop vibes that move from modern electronic beats to sampledelic masterpieces glued together with conscious, lyrical raps. 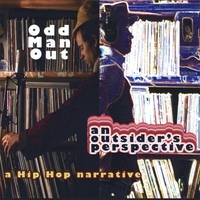 Odd Man Out represents a new chapter in the long tradition of the Bay Area’s socially conscious, message-based, genre-defying Hip Hop movement. Inspired by diverse Hip Hop veterans like Blackalicious, Tupac, Del, KRS-1, Rakim, Jurassic 5, and the Pharcyde, Odd Man Out never wastes a song on empty words or half-assed efforts. \"...his style echoes that of Japan\'s DJ Krush in his early and earthy work, fused with DJ Premier\'s soul-heavy, radio-friendly blend of hip-hop. This is a level of production that belongs on Stones Throw with Madlib and friends.. it does sound like a product of true love and a dedication to hip-hop... points to a new path, something different, perhaps more than underground and above the mainstream.\"